We have 3 Series of Turtle guitar bags, Series 103, Series 110 and Series 125. Turtle Series are available in 3, 10 and 25 mm padding and Cordura 600 Denier material All this bags are with a yellow stitching, attached rucksack straps, main and front handle. Worked-in protection for machine and bridge. Large music sheet pocket. The beginner’s model for young guitar players that are looking for a basic yet good protection for their guitar. The handle was specifically optimised for children’s hands. The rucksack straps allow for carrying the bag on the back and the music sheet pocket provides sufficient space for sheet music and accessories. THE gig bag most asked for by customers. Preferably chosen by young musicians and students that are on the move a lot with their guitar, looking for a very good protection and a very good equipment. The thickly padded handle and the fully lined deluxe rucksack fittings make for a high wearing comfort. The extended/expanded neck protection secures and cushions the instrument, thus providing optimal protection. 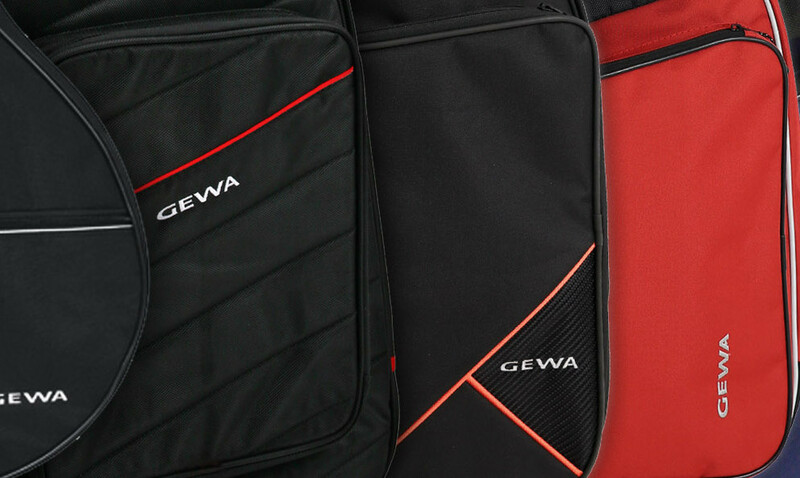 GEWA IP-G Series classical guitar bags have been designed for young musicians and students. The modern and fresh colour collection offers a good choice for every taste. Features like 10 mm padding, 600 Denier surface material, a large accessory pocket and attached rucksack straps will grant safety and convenience for transporting your instrument. Based on the GEWA Premium model this guitar gig bag was designed for musicians with high demands. The equally high wearing comfort is complemented with even more protection thanks to a thicker padding and a better neck protection system. Topped off by an additional large accessory pocket. Guitar players that wish to protect their instrument against jolts in the best possible way and find that a case is too heavy, go for the guitar gig bag Prestige 25. A newly developed, back padding provides comfortable travelling. The GEWA Cross bag is adapted on the diagonale stitching. A very sophisticated design, an extra-large music sheet pocket, refined deluxe rucksack fittings, YKK zipper with GEWA designed zipper head and an adjustable shock absorber with rubberised protective bottom part covering define this unique bag. This package of excellent wearing comfort and safety for the guitar is the ideal solution for a musician with extremely high demands. This guitar gig bag is mostly seen at conservatories and guitar workshops. High protection and utmost wearing comfort in brand design. 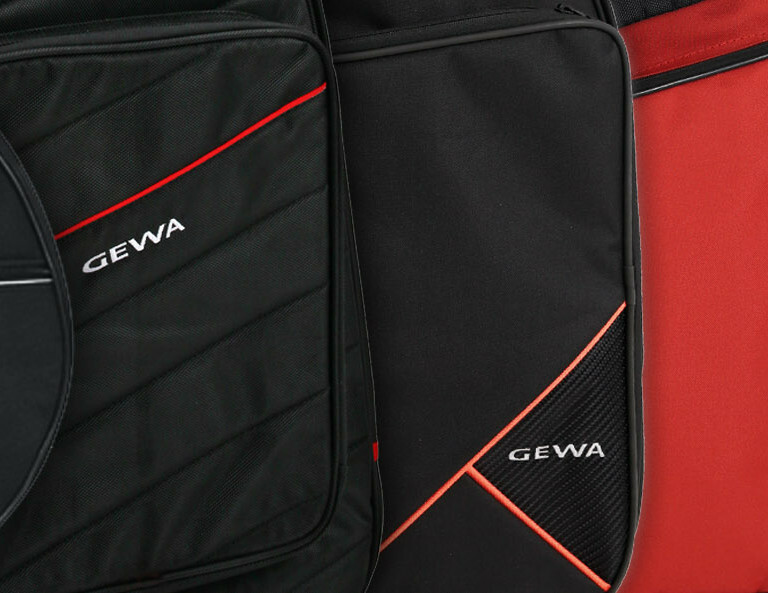 GEWA Classic instrument bags have been designed with musicians in mind that are looking for a reliable and affordable gig bag. Features like 5 mm padding, 600 Denier surface material, music sheet pocket and attached strap will grant safety and convenience for transporting your instrument.